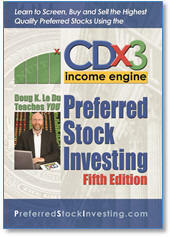 - from Stuart S., CDx3 Notification Service subscriber. 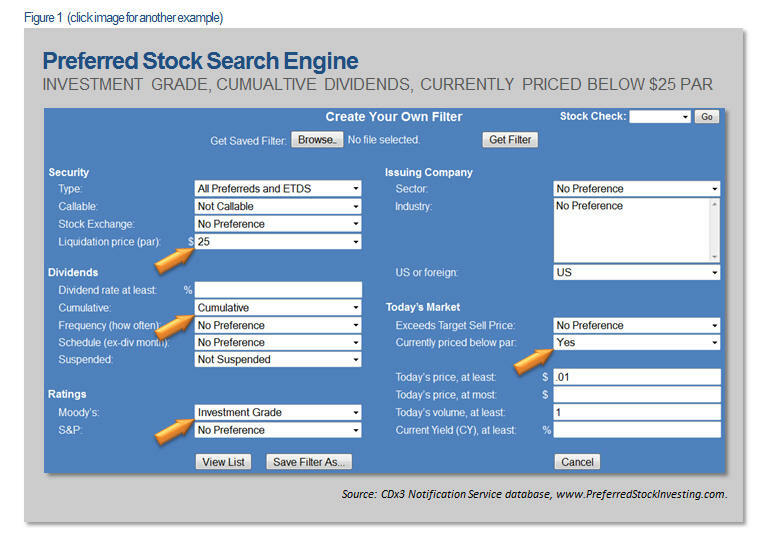 See more preferred stock investor reviews here. There were a total of 886 preferred stocks and ETDs trading on U.S. stock exchanges as last month came to a close. Of these 886, these are the top ten highest quality issues that are trading below their $25 par value. This list is sorted by dividend rate (coupon) with the highest payers listed first. There were five new preferred stocks issued during January 2016, bringing the total number of these securities trading on U.S. stock exchanges to 886. PSA-B is from Public Storage (PSA), WLGGP is from Wells Fargo (WFC), BKRRP is from Bank of America (BAC), CUBUP is from Customers Bancorp (CUBI) and CTGGP is from Citigroup (C). 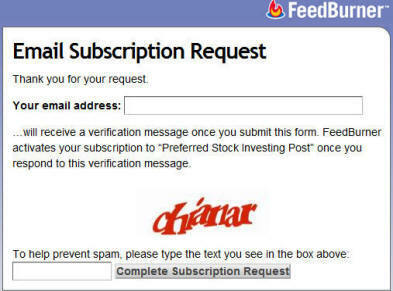 In most cases, newly issued preferred stocks will initially trade on the Over-The-Counter stock exchange under a temporary trading symbol until the big board exchange to which the new issue is destined (usually the NYSE) assigns the new, permanent symbol. The CUSIP numbers, however, always stay the same so I have provided them in the above table. PSA-B from Public Storage, for example, initially began trading on the OTC as PBSTP on January 14 but became PSA-B when NYSE trading began on January 21. Any shares that you purchase under the temporary OTC symbol are automatically transferred to the new, permanent symbol by your broker. Looking at the Exchange column above, the remaining four January issues are still trading on the OTC under temporary symbols (January 29), but should transfer to their respective big board exchanges shortly, their symbols changing at that time. WLGGP will become WFC-W; BKRRP will become BAC-C; CUBUP will become CUBI-D and CTGGP will become C-S. The OTC is a wholesale trading venue that individual investors can use just like the big guys, which can be especially beneficial during a period of high prices (see “Preferred Stock Buyers Change Tactics For Double-Digit Returns” for an explanation of how the OTC can be used to purchase shares for discounted prices during such a period). Customers Bancorp preferreds offer an example of how OTC prices can frequently be favorable. CUBI currently has two preferreds and one Exchange-Traded Debt Security trading. Notice how the new CUBUP, currently trading OTC, is trading for a much lower price ($25.25) than its NYSE peers, even though CUBUP offers a higher Yield-To-Call. 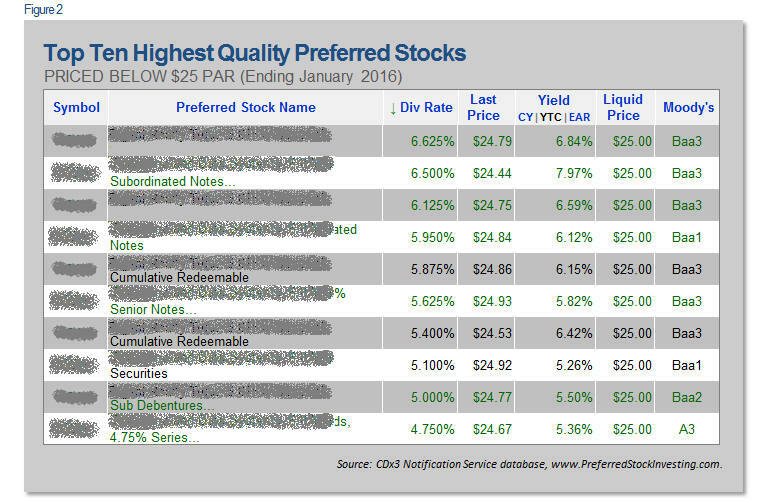 The power of investment grade ratings is really on display with these new January preferreds. At the end of January 2016, the average current yield of all call-protected, U.S.-traded preferred stocks was 7.892 percent (rated and unrated). For comparison, I have set the Yield column in the first table above to show the current yield of these new preferreds on January 29. While ratings are somewhat controversial, the benefit to the issuer is clear here. Public Storage is the highest rated REIT and is consistently able to issue new preferred stocks with coupons a full percentage point lower than its peers; the new PSA-B is no exception. Four of the five new preferreds issued during January are from banks – Wells Fargo, Bank of America, Customers Bancorp and Citigroup. As has been the case for several years now, new bank-issued preferred stocks offer non-cumulative dividends. On the upside, these four new issues are all designated as offering Qualified Dividend Income, providing a tax benefit to many buyers (see “Hidden Risks Of Tax-Advantaged Preferred Stocks” for data regarding whether QDI preferreds a really advantageous). 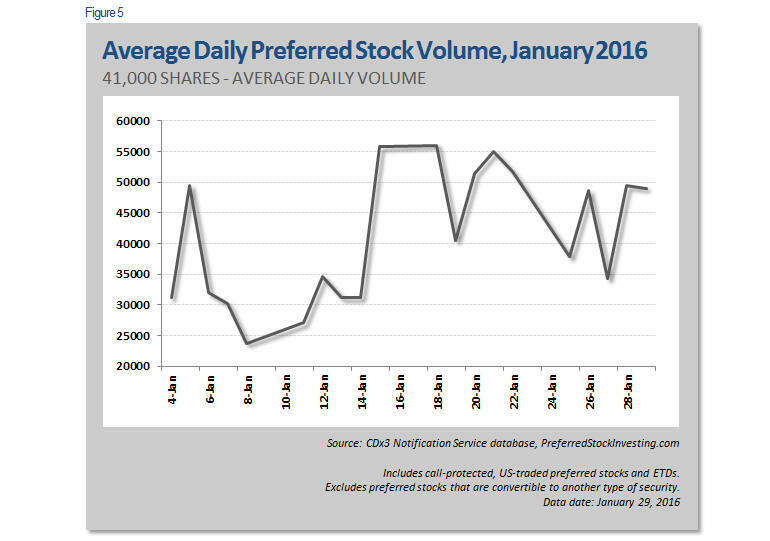 Regarding liquidity, as illustrated below, a preferred stock will generally trade around 41,000 shares per day on average. When I look at the biggest movers each month, bank-issued preferreds are always high on the liquidity list with around 50,000 shares trading daily, always led by the TBTF banks. Now take a look back at the Volume column of January’s new IPO’s. WLGGP from Wells Fargo and CTGGP from Citigroup were both about the same size at 35 million shares and 36 million shares, respectively. But look at the volume for Citigroup’s new CTGGP. Last Friday, this new preferred from Citi traded a whopping 3.6 million shares, making it one of the most popular new preferred stock offerings. January 2016 was a very typical month with its five new preferred stock offerings, but usually there is more industry diversification. While banks are almost always represented, don’t be surprised to see new issues from telecommunications, utilities, insurance companies and/or property REITs during February.